Anyang, a city nestling into the northern tip of Henan Province and overlapping the borders of the three provinces of Shanxi, Hebei and Shandong, abuts on the Taihang Mountains on the west and verges on the North-China Plain of the east. Descending down one of the eastern slopes of the mountains, the Huanhe River, while splitting the city in two. The city is in the northern temperate zone with a continental yet congenial climate with the monsoon, Seasonal changes where can be markedly felt with adequate shiny days to warrant yearly bumper harvests. The bulk of annual precipitation averaging 606.1 mm usually happens in months on end. The local annual average temperature stands at 13.6。C and the annual average barometric pressure here is registered at 1001.5 millibar. Placed under the jurisdiction of Anyang are 5 counties and 4 districts that have a population of 5.12 million. Among them 0.72 million are inhabited in the city which is 54 square km. 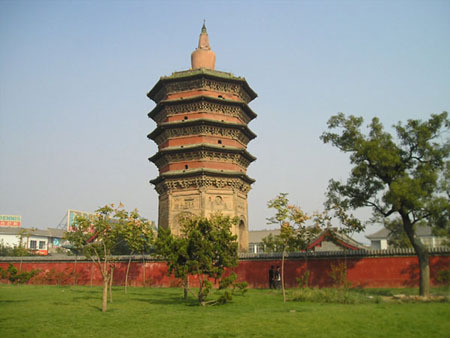 Across from the urban area lies the famous Ruins of Shang Dynasty which were protected as "a major historical and cultural site" by our country. In the southeastern portion of the urban areas is located "Anyang Hi-tech Development Zone" having attained a size of 24 square km. Having a history of about 3300 years, Anyang was chosen as the capital of Shang Dynasty in 1300 BC by King Pangeng, the 19th monarch of the dynasty. The newly unexplored site of ruins of that ancient capital-left by archaeologists is now traversed by both the Beijing-Guangzhou Railway and No.107 Highway. Over 3 millennia ago (termed by Chinese historians as the "Pre-Qin Era"), a magnificent agricultural economy was developed in a monarchy unfolded in areas surrounding Anyang that towered admirably at that time over the Orient. Anyang, one of Chinese seven famous ancient capitals, is a city renowned across China for its invaluable heritage of historic and cultural relics. There are not only cultural entities of Shang Dynasty such as inscription on bones and tortoise shells used for oracular purposes, bronze wares, and extensive remains of urban construction but also many well-known spectacles of profound humanistic interests: cave dwellings of the primitive hordes 25,000 years ago, mausoleums of the two ancient emperors, Youli Prison where YiJing (The Book of Changes) was written, cultural relics associated with the activities of the literati flourishing in the Eastern Han Dynasty, the place on the bank of the ancient a river where, just as is documented in official historical works, Ximen Bao succeeded in tactfully getting rid of a shrewd witch, and the native place of Yue Fei (an ancient national hero). Scenic attractions in Anyang are most liberal to visitors and tourists who will remember all the natural comeliness and charms here. Resorts such as Xiaonanhai Scenic Zone, Pearl Springs Sightseeing Zone, and captivating scenery in the Taihang Mountains, are an instiller of irresistible nostalgia that would leave tourists no peace until they come back to see these resorts again. There is, in Anyang, an aviation sports base that is located in a very weird geographical configuration and has, ever since it was constructed, been the favorite haunt of parachuters and sailplaning sportsmen. The Red Flag Canal, famed as "the World's 8th Great Wonder", now serves as a most valuable scenic spot for tourists. Grain, cotton, and oil crop are produced profusely in Anyang. Besides, forestry, fruit growing, and high-tech-based farming have sprung up in recent years and contributed enormously to the expansion in Anyang of produce market. Surplus produce from Anyang that is tremendous in amount is shipped to markets in other parts of China. Fruits and dried fruits from Linzhou and peanut and date from Neihuang County are the farm commodities that are famous in China. The construction of Anyang is now executed in compliance with the policy how to make the city develop continuosly and create better environment and accommodations for its inhabitants, how to protect its cultural resources. Therefore an adjustment of the previous program for city development has been made to facilitate urban traffic. Thus the middle section of Wenfeng Road, after its reconstruction is completed, will serve as an extended axis of the city. Ongoing are a number of projects such as the project of remolding the suburban power grids, the project for improving street illumination, the project for building sewage treatment plants and related infra-structural facilities. Their completion will not only pave the way for the city's future development but also add new physical charms to this traditionally honored city. Around the city are now mushrooming such residential quarters. Being invariably characterized by adequate amenities and excellent maintenance, some of them evince architectural classicism, while others are remarkable for exquisite sculptures. Their aesthetic qualities have not only the milieux here imbued with beauty but the inhabitants in these parts endued with goodwill. Anyang can boast its affluence in the resources of power, natural gas, water, minerals, and produce. Hosts of farsighted international investors have been attracted by the potentialities-exclusive with Anyang for high technological development. Now they and Anyang are knit into a cordial union for securing bilateral gains.